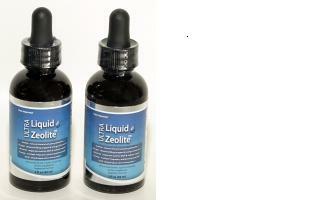 Liquid Zeolite Enhanced with DHQ 2 for $30 Only $15.00 ea. with $10 Flat Rate Shipping Worldwide - Liquid Zeolite Co. Inc.
We are the WORLD'S LEADING Manufacturer and Supplier of Liquid Zeolite Products: Liquid Zeolite Enhanced with DHQ! Selling Liquid Zeolite worldwide for nearly 16 years! Liquid Zeolite Enhanced with DHQ YOU get 2 bottles for $30, Only $15.00 each (Full 2 months supply) with $10 Flat Rate Shipping Worldwide! Each 1oz Bottle is a Full 1 Month Supply! It isn't genuine LIQUID ZEOLITE™ unless it says LIQUID ZEOLITE™ on the bottle! Our product OUTPERFORMS all competitor brands & copycat formulas. Only buy from the original Zeolite Company in business since 2000. We have more positive feedbacks & testimonials than all other liquid zeolite products combined! Our Liquid Zeolite™ works the best. See for yourself! WE receive hundreds of testimonials & positive feedbacks each month from the hundreds of resellers, distributors, and websites where our Liquid Zeolite is sold. Here are just of a few of the 5 star reviews we get constantly! This is the best single detox agent I have ever tried. I could feel the results in my mental clarity within the first 3 days. Ienthusiastically bought two more bottles recently. When I started, I used just 6 drops per day, and even with that lowest recommended dosage I could still feel the effects. I'm up to 13 drops now and will probably level off at that amount. 5.0 out of 5 stars AMAZING! After years of constipation, I am finally regular! Thanks to my friend , Saolo Ferreira for recommending it. 5.0 out of 5 stars Great stuff! Works great for removing heavy metal and pesticide. I have a tester at home and my number are going down! If you take your time to research and read... and most say OMG read what is that I am too lazy to do that! This is an Excellent Product... it is almost impossible to find a product that is able to accomplish what this product does w/o having to Suffer...IV's - or suppositories... and much discomfort. I and my family and friends who have used this product have all noticed a difference... especially with mental clarity...aluminum... is a silent killer and one of the #1 causes of early dementia. How often do you forget where you put your keys... OR just stand there and stare into your fridge...??? It is almost impossible to find a product that does not have to be administered by a doctor that is able to remove aluminum! I bought this because my hands were cracking badly and nothing would heal them. I read online that some people were concerned about heavy metals and using zeolite to chelate out the heavy metals. this was enough to interest me because I've been concerned about them for quite a while, but one commenter said she'd noticed healing from her cracked hands when she began zeolite. SCORE! I tried it and it took about 10 days but now I have healed cracks, the rough spots are smooth and the thickened spots are shrinking as well. I took six drops a day, and continued with lotion and creams since I do live in a very dry area of the country. now I only put the cream on once or twice a day instead of hourly (even that didn't help previous to zeolite). 5.0 out of 5 stars This stuff is great! Great product for detoxing humans and animals. Working on my dog with large cyst on hip and hair loss.Taken internally & mix with coconut oil for applying topically. After 3 weeks cyst shrinking and hair growing back. Helps my mom to aid in detoxing during her off chemo week. 5.0 out of 5 stars I feel SO much better now! Going to order more. I got sprayed by a crop duster last year and my health had deteriorated badly due to it.This helped relieve my body of the toxins and heavy metals. I feel SO much better now! I tried this for neuropathy in my feet. I have the "exploding toe" type of neuropathy with excrutiating pain and burning. This stuff helps!!! I'm ordering more right now. I could be wrong, but gargling with a glass of water with six or so drops of this in it (and then drinking it)seems to help get rid of a sore throat and ward off a cold v*rus. I pull it out whenever I think I might be coming down with something. Great product! I'm able to have restful sleep with no headaches. It actually works! I ordered another bottle. my son has had all heavy metals removed by your liq zeo and he is now growing better too! Great stuff- this was my 3rd order! Husband refused to be without! Thanks! I am introducing many to the benefits of L/Zeolites, one lady I helped had bad psoriasis on her legs, it prevents it, she has so much more energy using it as well. I can get by with 5 hours sleep, a night using it. Pure product for A+ health. Best-Buy! Thanks! This is my second order...outstanding product. God bless you! Only seller to get this product from! It works! Great product and shipping! I recently got your sample bottle to try. I love it. I feel wonderful! I know this will benefit the people I counsel. Great stuff. Really works. I will be reordering soon. THANKS SO MUCH!!!!! Ok have been on product 4 days an feel brand new like my power has come back and clarity is peaceful and sharp, and i know i haven't felt this feeling in a long time and it can only get better, am a little bit puzzled but excited!!! I had a cyst on my knee that was due to be surgically removed, and after 3-5 Days the cyst was gone, so I thought I would help spread the word about the benefit sof using liquid Zeolite! Hi I have purchased your zeolite for my personal use and for use in my clinic. I FEEL GREAT!! I started immediately on 10 drops x 3 x daily. Within days I started to notice a consistent high but calm energy, my right hip has stopped aching and the afternoon lag is gone. I have been taking natural supplements to support thyroid function and energy production and was getting great results on those but have noticed that adding the zeolites has taken my wellbeing to another level. I have used the mlm brand in the past and didn’t feel any different – only my credit card bill increased. Only seller to get this product from! It works! Great product! Will do business with again! Zeolite Rocks!!! Father in laws PS* levels went for 33 to 1.5 Wow!!!!!!! came as described,very pleased with product. I have had eczema for over 5 years on my forearms and triceap area. I used many different kinds of creams, but my body grew an immunity to them. The doctor told me the next step was taking steroids, but I did not want to go that path. This last winter of 2009-2010 was the worst, because I live in Nebraska and it was bitter cold and horribly dry. I was itching it up and down my arm, and I was starting to get splotches on my legs as well. I was reading that heavy metals and toxins can cause eczema. I started taking a product that has liquid zeolite in it, which goes directly into your blood stream and removes almost all heavy metals and toxins in your system. I started taking it about 5 months ago, and in one week my eczema went away, and has not came back. I have been eczema free for almost 5 months now, and I am so much happier. 3RD TIME ORDERING, FAST SHIPPING, GREAT PRODUCT, THANKS! Awesome Item and Deal!!! Thank you, A+ Seller!!! Love the product! Thanks for the free shipping! I have tried all type of Heavy Metal Detox and found yours to be the Best - I cannot believe how well it works. Great Seller! Very pleased with product. We only buy from this seller. Great zeolite. Product arrived very very fast, nice packaging, very satisfied.....thank you!!!! am a repeat customer. This stuff really works. hello, just wanted to say how impressed I am with your service, great, you are now my official zeolite supplier, it works so much better than the previous brand I used, i'm amazed. all the best. Great product. Will be back for more. Thanks! BACK AGAIN !! ..... IT WORKS ! ... I Love it !! ..... will buy again. great condition, very pleased with product. Great zeolite product, as usual! Will continue to buy. Truly the best water & blood natural detox agent on earth. Great Energy! Thanks! I am a regular buyer, love this product! Feeling better already!! Yeah! Thank you so much. I'm impressed with the effectiveness of this zeolite. Great value. FANTASTIC SELLER. GREAT PRODUCT! THANKS! Awesome A+ all the way! This is a repeat transaction. Very satisfied with product. Can recommend. i feel the best since i was 16 yrs old! i ordered 7 more bottles! Everything was great! The best zeolite, great customer service! I use zeolite for Rest* Leg Synd*, and I found this one works for less $$! 1 of the best natural products to purify water and sustain good health. Thanks!! great product and a lot less expensive than the MLM brand. Thank You! awesome service....miracle product...what a combo! thanks! I have g*oma. After just 2 days I notice my energy increased big time! GREAT BARGAIN. HEALTH IS PRICELESS. THANK YOU SO MUCH!!!!!!!!!!!!!!!! Very pleased, appears to be as good or better than wa*ora, love the price! Must-Have! Stops mouth pain on contact! Great energy burst! Luvin It! Thanks!! 1 of the Best investments I've made for good health. Stops pain fast! Thanks!! Already feeling the detox - after ONE 10 drop dosage! Great Product - Thank YOU! I am a returning customer,everyone should take this, Thank You!!!!!!!!!!!!!!!!!! I love it, I can't believe how great this stuff is. I will be ordering more!! We offer the best prices available anywhere to retail and wholesale customers worldwide. Liquid Zeolite Company Inc. has produced and sold zeolite products since 2000 (14 years). Please note that LIQUID ZEOLITE™ is NOT a "copycat zeolite", but a new, improved, and richer formulation, in a 30ml (1 ounce) bottle. Remember it isn't authentic LIQUID ZEOLITE™ unless it says LIQUID ZEOLITE™ on the bottle! Based on our customer comments, we believe LIQUID ZEOLITE™ is BETTER than ALL other zeolite brands... plus a LOT more affordable... along with FREE shipping within the USA. We receive testimonials on a daily basis and have many thousands of testimonials on file (more positive feedbacks & testimonials than ALL of the other liquid zeolite brands COMBINED). LIQUID ZEOLITE™ has NO taste, NO smell, and is VERY EASY to take. Just add to water (4 to 8 ounces) and drink. Check other brands of liquid zeolite. Are they manufactured in a GMP certified lab, licensed by the FDA? Are they USA made? We are! Good Manufacturing Practices (GMP) Certification Program verifies to consumers that dietary supplements are manufactured according to high standards. The third-party certification program includes inspections of dietary supplement manufacturing facilities to determine whether specified performance standards on a number of measures—including quality control, cleanliness, receiving and testing of raw materials—are being met. Heavy metals, pesticides and herbicides all leave the system; they do not get deposited elsewhere in the body. Forty percent of zeolite binds heavy metals in the gastrointestinal tract and 60 percent binds toxins in the bloodstream and at the cellular level. It seems zeolite powder is only 40% efficient, while the ultra liquid zeolite can work throughout the whole body...even at the cellular level. The humic mineral solution delivers the zeolite directly to the intracellular fluid. There, the humic minerals further act to chelate the heavy metals out of the cells so that they can be absorbed by the zeolite and carried out of your body. And finally, humic acid contains all of the minerals, trace minerals, and amino acids that your cells require for optimum functioning. So the most important thing for you to know if you wish to detoxify with zeolite is that you must choose a humic zeolite type of product. Whether you go with our Ultra Liquid Zeolite™ or some other humic zeolite, the chelating factor and carrier agency of the humic acid is crucial to success with zeolite supplementation. A clathrate is a crystalline cage structure capable of including another compound within its own structure. Chelation therapy may be described as a one-dimensional process. In contrast, oral clathration is a three-dimensional process. Liquid Zeolite™ has an unique crystalline lattice structure that literally wraps around toxic molecules with irreversible bonds, preventing additional reactions with tissues or organs as it is eliminated from the body. Liquid Zeolite™ incorporates clathration to effectively, naturally, and gently remove all contaminants – all of which collect in the cells of the body, brain/cerebral, blood, spinal fluid and lymphatic fluid: heavy metals (such as lead, mercury, and aluminum), toxic chemicals, toxins, vaccine residues, pesticides, and many others.Liquid Zeolite™ helps your body maintain optimum alkalinity, proper normalized pH levels and helps supercharge your immune system. It helps support a strong immune system and reduces toxic overload by removing toxins, chemicals & heavy metals. Our customers say our product is "Simply Amazing!" We like to refer to it as the Quantum Physics' answer to Well-Being! Studies have shown that highly energized foods & supplements can be very beneficial. Many customers claim our liquid zeolite formulation works FASTER than other liquid zeolite products. Liquid Zeolite™ helps support a strong immune system and reduces toxic overload by removing toxins, chemicals & heavy metals. ''The most important supplement you may EVER take!" LIQUID ZEOLITE™ is the NEWEST method to deliver zeolite to the cells. A proprietary, organically induced, advanced technology is used to absorb the natural cellular zeolite directly into the molecular structure of the humic mineral complex. The zeolite mineral molecule is ingested by the humic mineral complex, producing a highly stable and suspended potent bioavailable cell-penetrating supplement. NO CHEMICALS OR SOLVENTS USED. Combining cellular zeolite with humic/fulvic minerals, delivers a powerful natural chelating, pH balancing, immune supporting and remineralizing vitality supplement. Toxins poison our air, our water, our food, and our bodies. According to the EPA, 70,000 chemicals are used commercially in the U.S., 65,000 of which are potentially hazardous to our health. The Environmental Defense Council reports that more than four billion pounds of toxic chemicals are released into the environment each year, including 72 million pounds of known carcinogens. We live in a virtual "sea of pollutants", and we carry many of these toxins and heavy metals within us. As many as 25 percent of Americans are estimated to suffer from some degree of heavy metal poisoning, particularly from mercury, lead, cadmium, and arsenic. We are also exposed to a significant amount of radiation and increasing viral attacks. Our immune systems are further compromised by poor nutrition and unhealthy lifestyles, and most of us suffer from an excessively acidic pH level, which creates an internal environment in which cancer – as well as viral, bacterial, and fungal infections – can thrive. These synthetic chemicals and heavy metals can be found even in unborn children, being passed on by the mother through the placenta. Moreover, the foods that we eat are grown in "de-vitalized" soils and we are missing important trace minerals. Trace minerals are the catalysts the body uses to initiate complex reactions and it's these reactions that allow the body to stay healthy and fight disease. Throughout the last century, the level of trace minerals in our topsoil has been reduced due to our farming practices and method of fertilization. This disturbing fact has lead to a worldwide deficiency of these trace minerals in our food and our body. Many nutritionists attribute the ongoing decline in health that our society is experiencing, in large part, to deficiencies of trace minerals. Until recently, the only sure way to remove the most destructive heavy metals and toxins from our bodies was through I.V. chelation, a process both invasive and extremely expensive. And even if you spent hundreds of hours and thousands of dollars on chelation treatments, the toxins would start going right back in with your next breath, your next meal, your next beverage. LIQUID ZEOLITE™ been processed in such a way that it can NEVER withdraw necessary minerals or elements from your body only the harmful ones. In fact, it actually helps to remineralize your cells. This unique combination of humic and zeolite, provides the body with readily absorbable organic trace minerals in perfect ratios and with the appropriate ionic charge that can be readily absorbed by the small intestine. These trace minerals include the important platinum group metals in association with the macro minerals such as magnesium and potassium. The humic, quickly and efficiently carries the zeolite systemically throughout the body. This provides an abundance of this unique humic/zeolite compound to be readily available at a cellular level by placing it directly into the extracellular fluid. The cell then uses its ionic channels to pull in this compound as needed for optimal function, pH adaptation, energy production and detoxification. Given the general lack of physiologically available organic trace minerals in our diets today, and the bodies demand at every level for them, the humic proves to be a powerful carrier for the zeolite molecule. LIQUID ZEOLITE™ has no odor and no taste and is supplied in factory-sealed, laboratory-grade amber bottles. Often simple changes can make a massive difference to how we feel. Linus Pauling, winner of two Nobel Prizes, believed that 90% of all medical conditions are attributable to excessive heavy metals, toxins, toxic chemicals, and minerals and trace mineral deficiency. The zeolites are a group of minerals with a four-sided honeycomb structure and, rare among minerals, a negative magnetic charge. The effect of the structure and the magnetic charge is that zeolite draws heavy metals (including mercury, cadmium, lead, arsenic, aluminum, tin, excess iron, and toxins to it and simply engulfs them. The toxins "check in" and they can't "check out." Then the zeolite carries them safely and harmlessly out of the body through normal digestion. Ultra Liquid Zeolite™ is extremely safe and is completely eliminated from the body within 5 to 7 hours. Because zeolite is a natural substance on the U.S. Government's list of GRAS (generally regarded as safe), it is brought to the market as a powerful and unique detoxifier. 100% of the zeolite in our product (there are nearly 50 naturally-occurring zeolites) is the subgroup called "clinoptilolite". This type of zeolite that has been studied for its effect in human nutrition. Heavy metals are implicated as a causative factor in many illnesses. Click the button below to add the Liquid Zeolite Enhanced with DHQ 2 for $30 Only $15.00 ea. with $10 Flat Rate Shipping Worldwide to your wish list.